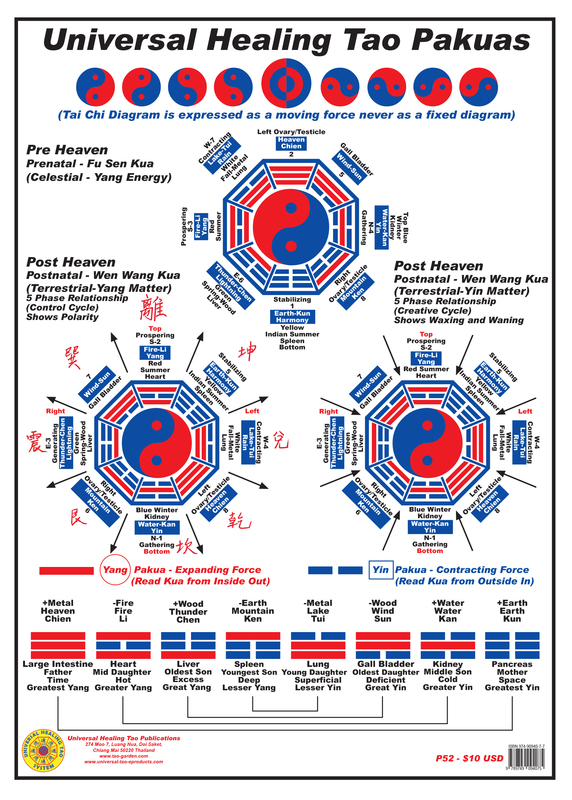 This poster illustrates Nine Styles of Tai Chi Diagram with Three different Pakua Applications (Pre Heaven-Celestial Yang Energy, Post Heaven-Terrestrial Yang Matter, Post Heaven-Terrestrial Yin Matter) giving a detail explanation of the Eight Forces with the Organ Elements and Family Structure, laid out in a beautiful blue and red format. A pakua may be perceived as an octagon formed from eight trigrams. However, to simplify the creation of a pakua for meditation, a simple web pattern is envisioned to form an image. This image consists of three eight-sided layers, with spokes connecting each layer, similar to the eight-sided, multi-layered cut of a normal diamond. The largest layer of the pakua is three inches (7.62 centimetres) in diameter. At the center is a Tai Chi (Yin and Yang) symbol that spirals to blend and transform the force. Behind the pakua, the diamond-shape of the image is realized further as all eight sides of the pakua create a funnel-like shape that converges at one central point.